Chabad Maple Bat Mitzvah Club Year End Dinner and Celebration for family and friends. Please register for yourselves, your family, and guests below. The photo package includes a USB of all high res pictures of the event including individual pictures of the Bat Mitzvah Girl. Families who purchase the photo package are welcome to come at 5:30 for family pictures. 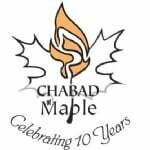 I would like to receive news and updates from Chabad of Maple by email.